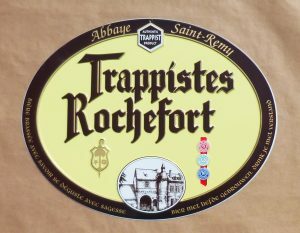 Brasserie de Rochefort or ” Abbaye Notre-Dame de Saint-Remy ” the official name of the Cistercencian Abbey of Rochefort deep in the Belgian Ardens is the Trappist brewer of the world-famous Rochefort beers. ” Trappistes Rochefort ” is a classic Belgian Trappist – Rochefort 6 – 8 and 10. Rochefort is bottled in 33 cl bottles and Rochfort 8 has an extra Christmas edition bottling (Cuvée) in 75 cl and 1.5 L Magum bottles. The brewery is most recognizable through it’s distinctive Trappist name and logo on mugs, glassware, bottles and beer-signs. Add your favorite Rochefort products to your pub-memorabilia collection !! Brasserie d’Ebly is most famous for their spectacular horn-shaped glass in the wooden stand. The glass is the perfect gift for any Belgian beer-fan’s collection of glassware ! 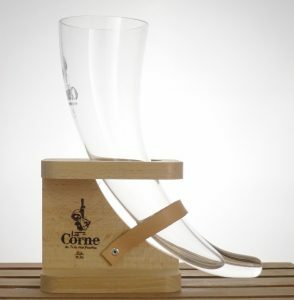 The XL version of the beerglass and the line of La Corne brews are available on our beer-shop. Cheers and enjoy this great piece of Belgian glassware !! Brouwerij Huyghe from Melle in Belgium brews the world-famous Delirium line of beers like the Delirium Tremens, Delirium Red, La Guillotine and Delirium Nocturnum among many other bottled brews. Brewery Huyghe was the pioneer in Belgium to introduce the 5 litre kegs of Delirium Tremens. Delirium Red and La Guillotine soon followed. Belgiuminabox.com was happy to start offering the beer-kegs in our inventory of beers. Many people got to know the cute-looking kegs, the apetite by beer-fans for beer in kegs is growing every year !! The kegs are easy and fun to use, serve the kegs shilled before tapping away. Beer-kegs are the perfect gift to fans of Belgian beer or to bring to a Summer barbecue and to share among friends. 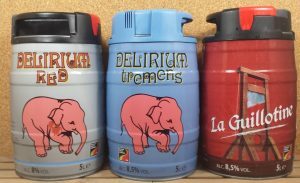 Get your own flavor of Delirium keg @ Belgiuminabox.com today. Brasserie de l’Abbaye du Val-Dieu of Aubel in the Belgian province of Liège is linked to the Cistercian Order, the Notre-Dame de Val-Dieu was founded in 1216 by Monks near Maastricht. The brewery makes Val-Dieu Blonde, Val-Dieu Brune, Val-Dieu Triple , Val-Dieu Bière de Noêl and Val-Dieu Grand-Cru. 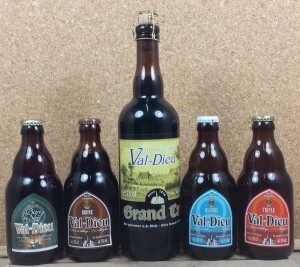 Belgiuminabox has added all Val-Dieu brews to the shop’s inventory. The Val-Dieu bottles are available in 33 cl and 75 cl as well as in crates of 24 bottles. Brasserie des Légendes from Irchonwelz, the brewer of Goliath Blonde and Goliath Triple are of now available at Belgiuminabox. Goliath Blonde and the Triple are available in 33 cl, 75 cl and by the crate. The brewery prides itself to be using 100% raw, natural and local products to brew their beers. 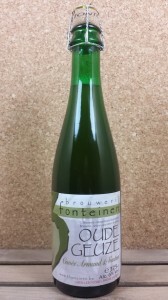 Belgiuminabox is opening up our popular Oude Geuze volume deal in 37.5 cl bottles ! Cuvée Armand & Gaston is a geuze made from 100% lambic brewed at “Brouwerij 3 Fonteinen” ! Belgiuminabox is putting 1 bottle of the Armand & Gaston per volume pack of 37.5 cl bottles with the brewer’s regular Oude Geuze from bottling year 2015. Get your 2015 volume deal here today !